Oliver's parents have disappeared. They have been caught on a Rambling Isle. Now Oliver must go in search of them. In this quest he is helped by short sighted mermaid called Iris, an grumpy Albatross and an island named Cliff. It will not be easy. There is the evil Stacey d'Lacey, an army of sea monkeys, a bloodthirsty island - and a seawig competition to win. Will Oliver succeed in getting his mum and dad back? This is a very welcome addition to the library shelves. Lively, imaginative and funny it will appeal to young readers in both KS1 and KS2 . Not only is it well written, as one would expect from Reeve, but the text is enlivened with Sarah McIntyre's quirky line illustrations that capture the character of the story (and the characters themselves). Here is a partnership that works. This is interesting. 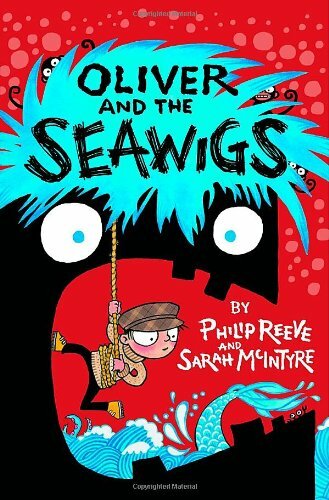 While Sarah McIntyre has already made a mark illustrating picture books that are funny, Philip Reeve is better known for novels aimed at a YA audience. Here he demonstrates a sense of humour that will attract a much younger readership. If, as is to be hoped, we may see more of Oliver and his friends, it will be a series to join Ottoline (Chris Riddell) and The Raven Mysteries (Marcus Sedgwick). Will young readers be able to wait?